I really wanted to iReddit and I guess I do. But it hasn’t been easy. Let’s get the basics out of the way before diving into the drama. The iReddit app is the iPhone interface for reddit.com, the social news site for accessing “what’s new and popular on the web.” Reddit.com is is ideal surfing material for when you have a little time to kill and need temporary distraction with news and humor. 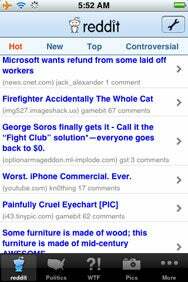 Given the challenge of using the reddit.com site through Mobile Safari (and given that reddit.com is owner by Wired) then iReddit, developed by CondéNet, should be a real winner app. When you first install it, iReddit is sweet. The app’s interface, speed, and overall experience is excellent. In fact, it was everything I had hoped for. There are even some pleasant surprises, such as the animated reddit alien that shows sympathetic impatience if Web pages take too long to load. iReddit also offers a Serendipity mode in which random stories are displayed—a cute idea, but nothing a real reddit user would find useful. My problems with iReddit started when I tried to log in with my reddit account—a necessity for commenting on stories, which is an important part of the reddit experience. The first three times I logged in to iReddit, the app crashed within 10 seconds. When it finally stabilized, it crashed when I tried to actually enter a comment. It also crashed every time I tried to use my custom reddits instead of the default. Any power-reddit user would find this useful right away as it is much easier to read and navigate than accessing the site through the built-in Safari browser on Apple’s mobile devices. The average newbie might want to wait for the proposed free, ad-driven version instead of paying for a buggy $1.99 app. iReddit is compatible with any iPhone or iPod touch running the iPhone 2.x software update.